How in the world anyone can say that these animal are not dangerous!, As with Sandra Herold getting off of charges from the state of CT. She didn't see him as a threat? Was she not watching TV or reading the news when St James Davis and his wife were attacked? WEST COVINA, Calif. - Probably no one better understands the profound and peculiar agony that chimp mauling victim Charla Nash is suffering than St. James Davis. 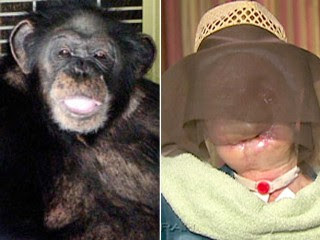 Davis survived a horrific chimpanzee attack at a California wildlife rescue center in March 2005 - but not before his nose and mouth were ripped off, an eye was gouged out, his left foot was mangled and most of his fingers and buttocks were devoured. He was in a medically induced coma for months. He's undergone more than 60 surgeries since. "I remember every bite, one at a time. I remember when I went to touch my face, my fingers looked really scary," Davis, 66, told the Daily News. He nearly bled to death three times as two hospitals denied him entry before a trauma center agreed to take him, he said. "I remember hearing someone say, 'Might as well just take him to the coroner's office,'" he said. "I cried myself to sleep every night for a long time." Almost four years later, Davis said the news of Nash's attack last week hit him hard. The Connecticut woman was visiting friend Sandra Herold in Stamford on Monday when Herold's pet chimp, Travis, suddenly went wild. Nash was badly mauled before cops shot and killed Travis. Nash has been transferred to an Ohio hospital for extensive reconstruction. "It's so much like my story," Davis said. 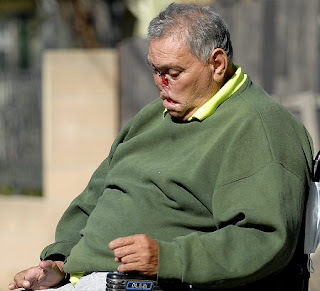 "I hoped it would never happen again," he said, sitting on an electric wheelchair with a prosthetic nose hanging lopsided over two thin red cavities where his own nose used to be. "She probably can't talk. I couldn't even grunt. But she needs to hear voices she knows." Unlike Nash, Davis had extensive experience with chimpanzees. 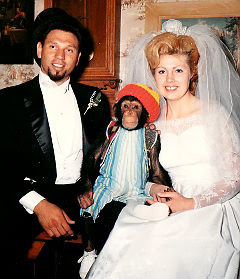 He and his wife, LaDonna Davis, raised a baby chimp like a human in their suburban home for three decades. They taught their "boy" Moe to dress in plaid dinner jackets, eat with a fork and knife, drive a car, use the toilet and write his own name. Moe, reportedly rescued from poachers in Africa in 1967, even stood as the best man at their wedding. The locally famous chimp allegedly bit a woman who stuck her finger in his cage in 1999 and had to be removed to an animal sanctuary. Moe was living in the sanctuary on the day of Davis' attack. It was not Moe who turned on Davis, but rather two other chimpanzees that had escaped their enclosure. Though he still has nightmares and says he'll never own another pet, Davis didn't sue the sanctuary and doesn't support new restrictions on people who wish to keep potentially dangerous wild animals in their homes. "Obviously, in most situations, chimps should not be living in homes. But there are exceptional circumstances," said powerhouse civil-rights attorney Gloria Allred, who acts as Davis' advocate. "Certain dogs attack. We don't say no dogs should live in homes when one is violent." Once a hulking high school football player and NASCAR driver, Davis has more surgeries on the horizon. He needs further reconstruction on his upper lip and a special pair of dentures to help him eat without LaDonna's help. He said his New Year's resolution was to stop crying and get out of the house every week. He promotes a book he helped write about Moe and attended a NASCAR event Friday. "She'll wonder the same things I did: 'Why me?' She'll want to take that day back. But you can't. You have to go on and be the best patient for your doctors," he said. "You have to give thanks you're still alive." For a copy of Davis' $20 book, "Moe," contact him at 616 N. Vincent Ave., West Covina, CA 91790.